Every Saturday morning, my soon to be eight year old asks me if she can have pancakes for breakfast and I hesitate..While I love pancakes, I have always had issues making them such as the pancake is not cooked through or it is too brown (read burnt) and it was nothing like the ones that they make at IHOP :(. So it came to a point where I used to dread making them..but one day (which is today), I decided enough is enough and it was time to do some full-on research on how to make the perfect golden-brown pancakes and I found out that the key ingredient that was missing in the recipe that I had was PATIENCE 🙂 and also the fact that pancakes need to be cooked at medium to low heat. Here’s a checklist I have put together based on my experience and from doing my research on good old Google. Check your ingredients – Make sure you use only the freshest ingredients possible. If the baking soda is more than 6 months old, don’t use it. Do Not over-mix – If the pancake mixture is lumpy, it is fine. Mix only till the flour streaks have disappeared. 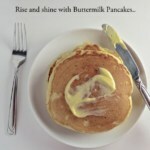 Batter consistency – Use more liquid for thinner pancakes and for thicker pancakes use less. Use a heavy bottomed pan – Use a thin pan and your pancakes will burn very quickly. Overheating the pan – I have noticed the pancakes brown nicely when the heat is set to medium or medium to low heat. Flipping the pancakes – The cue to turning or flipping the pancakes on the other side is when the edges start looking dry AND when the bubbles that have formed on the pancake start popping. You need to flip them only once – over-handling toughens them. 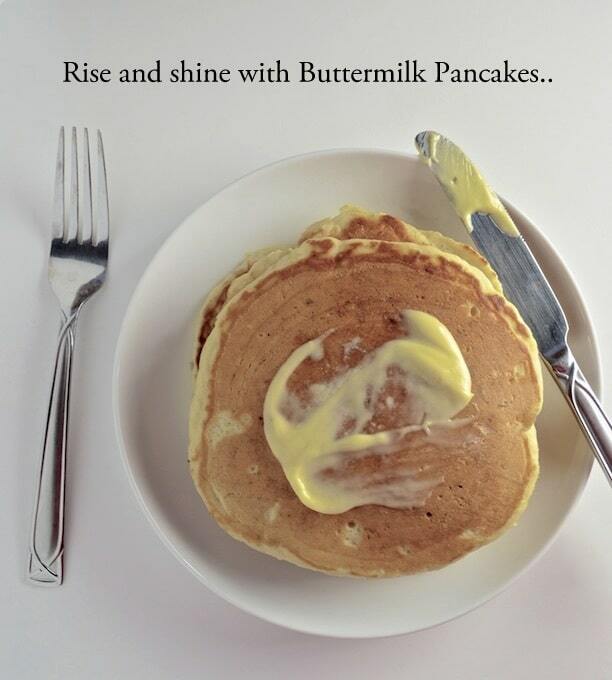 Reducing smearing of the pancake batter – Flip the pancakes as close to the pan as possible. Using a fish spatula is recommended. Use clarified butter (ghee) for greasing the pan – Yes, you heard me – Use ghee. Apart from imparting an awesome taste, it doesn’t burn easily like butter. Don’t forget to wipe your pan off after a couple of batches or so. Found these pearls of wisdom from the following websites – Bon Appetit and Aunt Jemima. That’s all I have. Go ahead, give it a try and make some soft, fluffy and melt in the mouth pancakes. The recipe is adapted from these two websites – Allrecipes and Oh, sweet basil. Clarified butter or ghee for greasing. In a medium bowl, whisk the dry ingredients - flour, salt, baking soda, baking powder, and sugar till combined. In a separate bowl, whisk buttermilk, eggs, and butter till they are well blended. Combine the wet and dry ingredients and use a spoon to blend them together till there are no flour streaks remaining. Do not over mix. It is okay to have a lumpy batter. Heat a heavy bottomed pan for 2-3 minutes. Grease it with clarified butter. Using a ladle to scoop the batter and pour it into the pan.Cook until bubbles start to form and pop. Flip the pancake to cook the other side till the other side is browned as well. Serve immediately with butter or maple syrup.